"Cottesloe" redirects here. For other uses, see Cottesloe (disambiguation). This article is about a suburb of Perth, Western Australia. For the local government area, see Town of Cottesloe. Cottesloe is a western suburb of Perth, Western Australia, within the Town of Cottesloe. Cottesloe was named for Thomas Fremantle, 1st Baron Cottesloe, a prominent Tory politician and the brother of Admiral Sir Charles Fremantle for whom the city of Fremantle was named. The nearby suburb of Swanbourne was named for the Fremantle family seat, Swanbourne House, in Swanbourne, Buckinghamshire. Cottesloe was home to Australian Prime Minister John Curtin. The house he built still stands in Jarrad Street. It is now vested jointly in the National Trust of Australia (WA) and Curtin University. Cottesloe is bounded by the Vlamingh Memorial to the south, Stirling Highway, Parry Street (West side) and West Coast Highway to the east; North Street to the north and the Indian Ocean to the west. A large part of Cottesloe is residential, although a significant shopping area is located along Stirling Highway, and a 9-hole golf course is on Jarrad Street. In the 2016 census, there were 7,375 people in Cottesloe. 68.8% of people were born in Australia. The most common countries of birth were England 8.6%, South Africa 1.8%, New Zealand 1.6% and United States of America 1.4%. 86.6% of people spoke only English at home. The most common responses for religion were No Religion 36.4%, Anglican 22.6% and Catholic 19.3%. Of the occupied private dwellings in Cottesloe, 66.9% were separate houses, 14.9% were semi-detached, row or terrace houses, townhouses etc, 18.1% were flat or apartments. Of the employed people in Cottesloe, 7.2% worked in Hospitals (except Psychiatric Hospitals). Other major industries of employment included Legal Services 3.6% and General Practice Medical Services 3.0%. Historically the beach and its panorama are reflections of the changes in the last 110 years of Perth's history. The photos and paintings of Cottesloe Beach that are either in collections or published, give tangible evidence of the importance of beach-oriented activities in the Perth community. Cottesloe Beach is a popular place for beach cricket. An oceanway allows pedestrians and cyclists to move along the beaches in a sustainable manner. 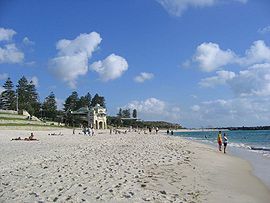 In 2009, Lonely Planet named Cottesloe Beach the world's 2nd best beach for families. A new town planning scheme was approved for Cottesloe allowing developers to build to five storeys high along Marine Terrace with the Ocean Beach Hotel site allowed to reach eight storeys. The decision followed a two decade long debate. Cottesloe is part of the federal division of Curtin. From 1901 to 1968 and from 1974 to 1980 it was part of the Fremantle electorate. Curtin is regarded as a safe seat for the centre right Liberal Party, which has held the seat continually since its inception, with the exception of a period from 1996 to 1998 when former Liberal member Allan Rocher held the seat as an Independent. The current member is Foreign Minister Julie Bishop. In the parliament of Western Australia, the Legislative Assembly electoral district of Cottesloe is held by Dr David Honey, also of the Liberal Party. John Curtin, Prime Minister of Australia for much of World War II, was local federal member of parliament from 1928 to 1931 and 1934 to 1945. He lived in Cottesloe from 1918 until his death in office in 1945. John Curtin's house in Jarrad Street is vested in the National Trust of Australia (WA) and Curtin University. During 2008 there was a suggestion that the house be relocated to the Curtin University grounds but the decision was made that the house remain in Cottesloe. In May 2009 the federal government announced that it would provide a grant of $580,000 to the National Trust to restore the house. Claude de Bernales was a mining entrepreneur who in 1911 bought Attorney-General Richard Pennefather's 1898 Federation Queen Anne house, naming it Overton Lodge. In 1936 it was rebuilt as a 30-room Inter-war Spanish Mission style residence, designed by Bernard Evans. It was bought for ₤30,000 by the Town of Cottesloe in 1950 and renamed the Cottesloe War Memorial Town Hall and Civic Centre. Former West Coast Eagles premiership player Chris Mainwaring lived in Cottesloe before his death on 1 October 2007. In December 2008 the Town voted to restore the pylon, a concrete structure built in 1935, at a cost of $172,000. Decades of battering by the ocean has eroded the pylon, which was one of three pylons built to anchor a shark net following a fatal attack in 1925. Two were destroyed by storms in 1937. Since then it has become an iconic landmark and popular diving platform for beach users. During major storm activity on 21–22 May 2009, the spike was knocked off the pylon. However this is not the first time this has occurred: during storms in 1995, the spike was also knocked over. It then remained on the bottom of the ocean in approximately 3 metres of water until an unnamed group removed the 800-kilogram (1,764 lb) structure using nothing but wood and rope. After the pylon was restored, it was painted in the Cottesloe Surf Lifesaving Club colours, but it was soon changed to the colours of North Cottesloe Lifesaving Club. It has alternated colours many times since. ^ a b c d Australian Bureau of Statistics (27 June 2017). "Cottesloe (State Suburb)". 2016 Census QuickStats. Retrieved 27 November 2018. Material was copied from this source, which is available under a Creative Commons Attribution 4.0 International License. ^ "Perth & Fremantle Halfway House". The Herald. Fremantle, WA. 12 February 1870. p. 2. Retrieved 1 March 2017. ^ 2006 StreetSmart directory, Department of Lands and Surveys, Perth. ^ Fahmy, Miral (14 August 2009). Travel Picks: Top 10 beach holidays for families, Reuters UK. Retrieved 9 June 2011. ^ "New height limits for Cottesloe approved; Barnett says 'Gold Coast high-rise' fears unfounded". Australian Broadcasting Corporation. 23 July 2014. Retrieved 23 July 2014. ^ Cash appeal for beach shuttle, Subiaco Post, p. 12. 10 July 2004, published by Post Newspapers Pty Ltd.
^ "About Julie Bishop". Julie Bishop Federal Member for Curtin. Retrieved 1 March 2017. ^ "Hon. Colin James Barnett MLA". Member list. Perth, WA: Parliament of Western Australia. 2017. Retrieved 1 March 2017. ^ Dolan, David (July 2002). "Another Prime Minister's House Museum?". Open Museum Journal. 5. Retrieved 2011-06-22. ^ "Wartime PM's Cottesloe home to be restored". The West Australian. 22 May 2009. Archived from the original on 24 May 2009. Retrieved 22 May 2009. ^ "Overton Lodge, Residence of Mr C de Bernales. A Big Building Scheme". Western Mail. Perth. 30 Sep 1937. p. 18. Retrieved 1 June 2014. ^ "Cottesloe Centre. Overton Lodge Adaptation". The West Australian. Perth. 24 Feb 1950. p. 10. Retrieved 1 June 2014. ^ "Cottesloe Town Hall. Former Overton Lodge". Kalgoorlie Miner. 2 Oct 1950. p. 4. Retrieved 1 June 2014. ^ "Work Started on Cottesloe's Shark-Proof Enclosure". Daily News. Perth. 25 Mar 1935. p. 3. Retrieved 1 June 2014. ^ "Cottesloe pylon knocked over during overnight storms". The West Australian. 22 May 2009. Archived from the original on 24 May 2009. Retrieved 22 May 2009.